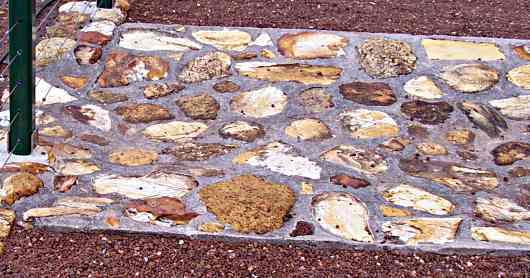 How to create an exposed aggregate decorative concrete finishes for flatwork. An old technique that is enjoying a deserved revival. 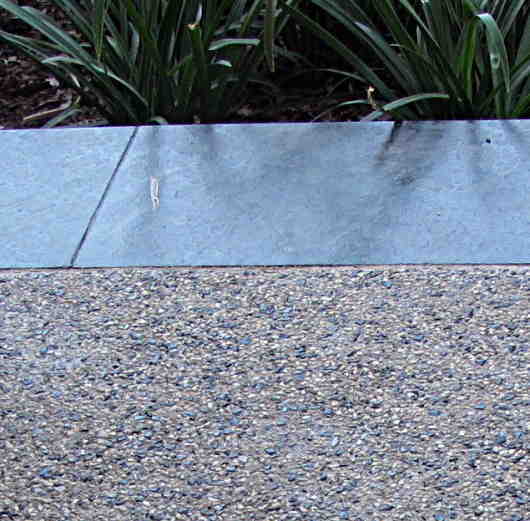 Exposed aggregate finish is seen as cheap to create,different and definitely non skid. Table of contents for this page. Exposed aggregate - A seeded exposed finish to a patio slab. The under laying concrete may well use a standard mix with 20mm aggregate, but the seeded pebbles here have an average size of 5mm to give a fine grained and smoother effect. I am a great believer in going a touch extra and this is a fine example. Used here is a natural slate coping to the edge of the concrete slab. 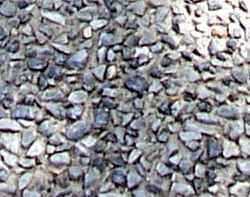 Aggregate is the name to the crushed rock that along with cement make up concrete as a whole. The term is also used for the smaller particles which are commonly called sand. They are still crushed or worn down rock. The average concrete that we use in house construction has very specific aggregate mixes, it will have a certain percentage of rocks that just pass through a certain size sieve. It may then have some rocks that pass through a smaller sieve to fill up the larger gaps. Then it has smaller stones and sand which with the cement fill up the smallest spaces in the mix. This material, the sand and cement paste that fills up the gaps between the larger pieces of aggregate is known as fines. Concrete is usually described by it's strength and then by the size of the largest aggregate used. Usually for structural concrete in home building the maximum aggregate size is 20mm. We use 10m concrete mixes for more specific jobs like blockwork corefill or paving slabs. Exposed aggregate - At the other end of the scale, large rocks dropped into wet cement to control water run off erosion. We are not confined to just the standard aggregate sizes of course. When I used to do work on bridges and culverts we were allowed to use large rocks, plumbs in Cyclopean concrete similar to the above photo. This was done purely to break up the flow of water, but it occurs to me that in landscaping work this technique could be used purely for decorative effect. The finished appearance is mainly created by the choice of the aggregates. Exposed aggregate - A stock standard 10mm concrete mix. No additives or seeding. A good none skid footpath or pavement. The aggregates can vary in size. They can vary in texture from smooth river worn pebbles that are ideal for barefoot traffic around pool areas to the sharp crushed rocks for driveways. The colour can vary from white quartz through to almost black basalt. It can often be combinations of different colours of aggregates. The material itself may also vary, especially with seeded surfaces. For example crushed glass is not uncommon. Adding to the options above above variety can also be added by using white cement rather than the standard gray. Liquid dyes or powdered ochres can be added to the mix to create more contrasts in the concrete. So the term "exposed aggregate" refers to a process of, in one way or another removing the "fines", which are the smaller sand and cement particles that bind the concrete together, from the top surface of the slab. The most common way, by water. The most simple way for a small slab, easy for a DIY-er to get a feel for the process, is to pour a small section, say one square meter, of concrete in the normal way, to screed and float it flat and smooth and then wait. Wait until the surface laitance has dried and the concrete surface is firm to the touch. Then with a running garden hose wash the surface gently and at the same time brush the surface with a soft brush. The combination of running water and the action of the brush exposes the larger pieces of aggregate. The whole process is one of feel. When to start, when to know that enough is enough. Contractors mostly use a water blaster to remove the fines. Working on larger areas requires more preparation and at least two people to do the finishing. After the surface is bull floated smooth and the laitance has dried it is common (but not always) to spray the surface with a retarder. This may be be a commercial product made for the job. These are usually sprayed onto the surface using an ordinary garden type backpack spray. TIP I have seen a couple of kilos of household sugar mixed with a few litres of water do the same job. The retarder slows down the setting of the top layer of concrete to allow more working time, while the main body of the slab is setting allowing foot traffic. As soon as the concrete is firm enough to walk upon with smooth soled shoes the washing out of the fines begins. The start is made at the oldest concrete placed and working towards the last that was poured. One guy uses a stiff bristle broom to loosen the material and the other guy washes it away with the blaster. For the most part cont actors (myself included) use a fairly large capacity water blaster, say 3000psi with plenty water delivery. 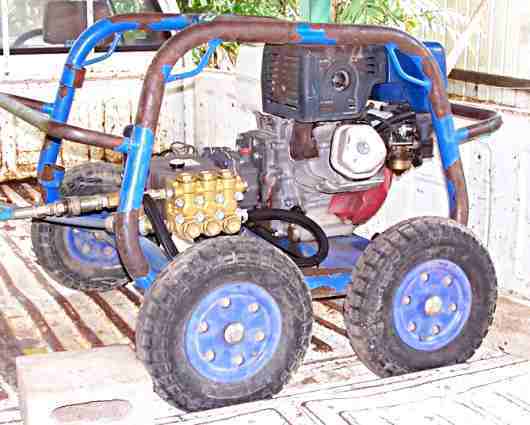 Usually with a 5hp petrol engine. The large size and full power of the unit is DEFINITELY not needed to start the washing out. The spray pattern is used as wide as possible and the nozzle is kept well above the surface being washed. The main reason for the large size is the volume of water available to move the sandy debris out of the way and to show quickly the progress of the work. In the event of the concrete setting sooner than expected the extra power of the blaster may have to be used, but this really only happens in cases where people without experience have "bitten of more than they can chew". That is they have tried to finish too large an area than they have experience with. Usually the morning after the pour the surface is again water blasted clean to remove any dusty film that may still be present. 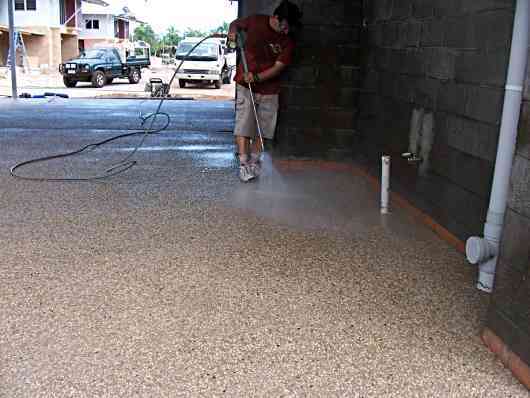 Exposed aggregate - Cleaning the set concrete with a water blaster. On large construction sites grit blasting is used to remove unwanted laitance and debris to provide clean joints between pours. Now I am not advocating this as an alternative to the water blast. It is very expensive but cost effective in terms of quality and speed. Because of all the safety requirements and the cost of the shot or beads when using a dry system, I once bought a wet sand blasting attachment for my water blaster similar to the one in photo above. This consisted of a separate wet blaster hand piece that had a feed hose from a barrel of dry sand. The sand was sucked from the barrel by a simple venturi and a stream of wet sand could be directed at the surface. This wet sand blast system was excellent for small jobs and could be very effective in just picking out designs in otherwise plain concrete. Another way to create exposed aggregate patterns in plain concrete is to use a bush hammer or the smaller needle scabbler. These are hand held air operated tools that that strike the surface of the concrete chipping away the softer fine particles exposing the harder aggregate. These tools as you can imagine are hard work to use, but they can be used quite precisely and I am sure in the right hands some interesting effects can be achieved. Go To Top : Exposed aggregate. The crushed stone, rock, sand, gravel, brick or even glass that form one of the three main constituents of a concrete mix. The others being cement and water. Mass concrete (unreinforced) with large rocks or stones added. From Cyclopean Masonry which is ancient walls constructed with large stones. The smallest particles in a concrete mix. The milky scum that forms on the surface of vibrated concrete. When new concrete is being joined as in a slab sat on top of columns the the residue of the laitance is scabbled off to provide clean concrete at the join. In flatwork a lot of laitance is a sign of too much water has been added to the mix. It sould be allowed to run off or be sponged of or the surface will be dusty. To chip the face off concrete to expose clean sharp aggregate. Usually to provide a surface that will create a good bond to new concrete but also can be used for a decorative effect. Diy decorative concrete An outline of traditional and modern methods. Ideas and inspiration . Decorative concrete . More techniques and ideas. Exposed aggregate. An in depth description. Simple and cheap but very effective. Stamped concrete From subtle effects to bold designs. Polished concrete floors. A few examples of stunning floors.